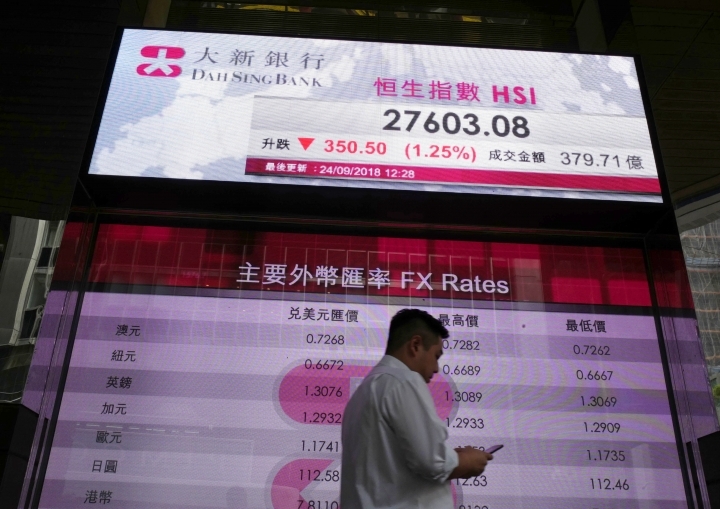 BANGKOK — Global stock markets were down on Monday after China reportedly rebuffed a plan for talks with the U.S. on resolving their dispute over trade and technology. Oil rose after OPEC decided against increasing its output further. KEEPING SCORE: Germany's DAX fell 0.4 percent to 12,387 and the CAC 40 in France lost 0.2 percent to 5,482. The FTSE 100 in Britain lost 0.2 percent to 7,472. The futures contracts for the Dow Jones industrial average fell 0.1 percent while the S&P 500 futures dropped 0.2 percent, auguring a slow start on Wall Street. 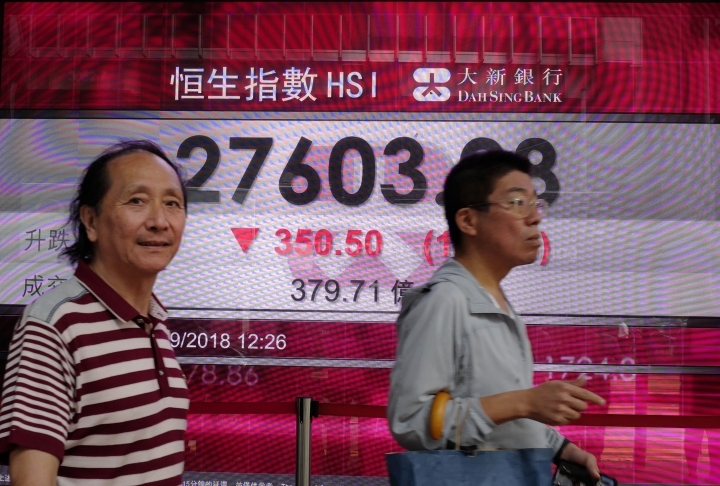 THE DAY IN ASIA: Hong Kong's Hang Seng index fell 1.6 percent to 27,499.39 and Australia's S&P ASX 200 edged 0.1 percent lower to 6,186.90. India's Sensex gave up 1.5 percent to 36,296.80. 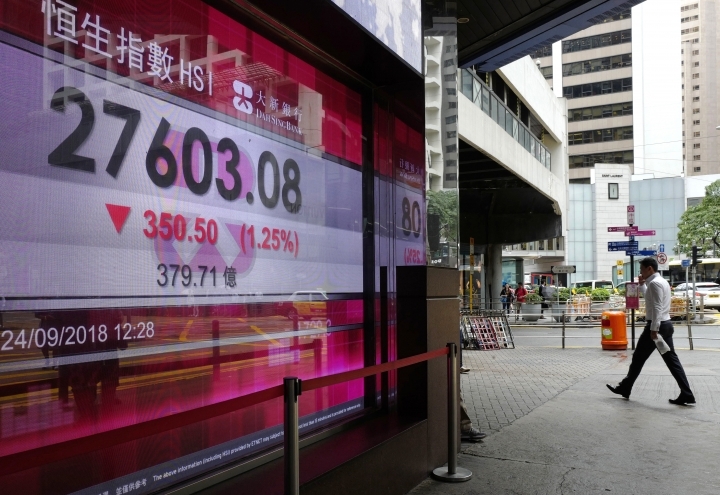 Shares rose in Singapore but fell in Thailand and Indonesia. Markets in Japan, South Korea, Shanghai and elsewhere in the region were closed for national holidays. CHINA-US-TRADE: China and the U.S. pressed ahead with another tariff hike on each other's products. There was no sign that proposed trade talks between Washington and Beijing would go ahead. The two sides have announced penalty tariffs on tens of billions of dollars' worth of each other's exports in an escalating dispute over Beijing's state-led technology development and other policies. ANALYST'S VIEWPOINT: "The weekend headlines have not been a blessing for 'risk sentiment,'" Stephen Innes of OANDA said in a commentary. He added, "the optimist in me is siding on 'this too shall pass,' but with markets closed in Japan, China and South Korea as a large part of Asia celebrates the Mid-Autumn festival, it impossible to gauge sentiment in these drastically diminished liquidity conditions." CORPORATE DEALS: Shares in European pay TV company Sky Plc were up about 9 percent after Comcast won a bidding auction for the company. Barrick Gold Corp.'s stock rose more than 2 percent in premarket trading on the news it is buying Randgold, whose shares jumped more than 6 percent, to create the world's biggest gold miner. ENERGY: Benchmark U.S. crude picked up $1.30 cents to $72.09 per barrel after OPEC and key allies like Russia decided against increasing their output more than they had agreed to do in June. Brent crude, used to price international oils, added $1.83 to $80.63 per barrel, its highest in almost four years. Production is dropping in some OPEC countries — like Iran, which is crippled by U.S. sanctions — and there is only so much that other nations, like Saudi Arabia, can do without shaking the balance of power in the cartel. U.S. President Donald Trump has called publicly on OPEC to bring down prices. 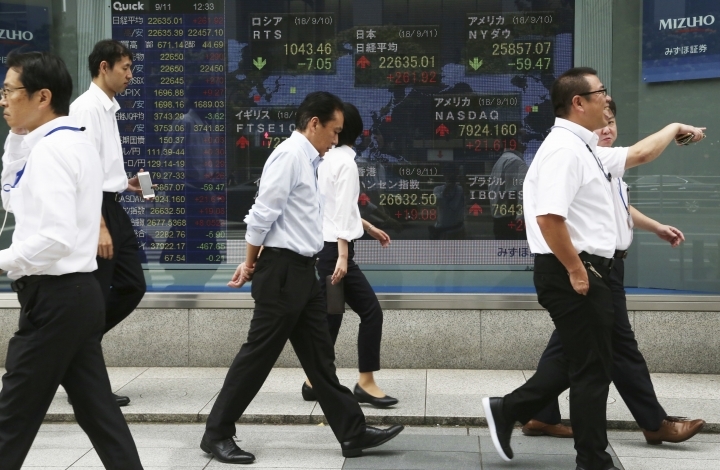 CURRENCIES: The dollar rose to 112.64 yen from Friday's 112.60 yen. The euro climbed to $1.1766 from $1.1752. The British pound rose to $1.3155 from $1.3072.